From ‘Dropout Factories’ to record graduation in Tacoma, Wash.
Graduating Class of 2015 from Mt. Tahoma High School stretch out the Graduate Tacoma! flag. Guest post by Eric Wilson, President & CEO of Graduate Tacoma!, a StriveTogether Cradle to Career Network partnership in Tacoma, Wash. It was time for a bold, ambitious, Tacoma-built goal that represented the community’s high expectations for all students, shared responsibility with parents, educators AND community and an unwavering belief in the potential of every child to succeed, regardless of background. The “Graduate Tacoma!” movement was born. Tacoma faced low graduation rates, a diverse and highly-mobile student population and a recession that sent poverty levels surging from 48 to 64 percent in one decade. That same year the Foundation for Tacoma Students was founded to build and strengthen the communitywide movement to help every student achieve success from cradle to college and career. By the Class of 2020, we will increase by 50 percent both the graduation rate of Tacoma Public Schools students and those who complete a college degree or technical certificate. Success will require measuring and closing gaps in access, opportunities and achievement for all students from cradle to college and career. The community recognizes we have lots of room to improve in early learning, but Tacoma has a unique opportunity to improve with new data. In 2012, Tacoma began assessing every entering kindergartener in six developmental areas: literacy; math; cognitive; language; social; and physical. We now track and disaggregate this data over time to help guide early learning strategies. The Network also joined the Campaign for Grade Level Reading and focused early literacy efforts on parent outreach to specific communities with 90 percent free and reduced lunch and significant racial and ethnic diversity. Tutors provide one-on-one reading time with elementary students and books are mailed weekly to families this summer to expand access when school is not in session. To combat the summer learning slide, Graduate Tacoma! launched a new website SummerLearningTacoma.org to increase access and build awareness of free or low-cost quality summer learning programs. It features 80 organizations and over 220 programs searchable by calendar, neighborhood, fee v. scholarships and type of learning. Last year’s launch included over 26,000 searches and registered a 59 percent increase in summer program slots-filled at partner organizations over the previous year — 5,616 to 8,919. The Network also translates college support and summer learning materials for parents who do not yet speak or read English. Just 25 percent of Tacoma adults hold a college degree, and local students are often first in their families to go to college. Cost is a major barrier with nearly two-thirds of students living in poverty. Each year, the Network and district successfully sign up nearly 100 percent of eligible students by the required middle school deadline for Washington’s College Bound Scholarship. Students who sign up, get into college and maintain good citizenship are qualified for four years of college tuition free. The SAT is now offered free to all Tacoma students. Participation has soared from 50 percent in 2010 to 83 percent in 2014. Students enrolling in college-eligible classes also have increased from 34 percent to 57 percent. Most significantly, college admission has increased from 33 to 43 percent and college completion has increased from 31 to 37 percent over the last three years. It’s working. Tacoma is making steady student progress toward our shared goal. 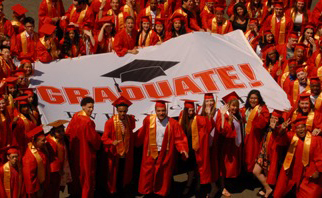 In just five years, high school graduation rates for Tacoma students have risen from 55 to 78 percent — a record high for the district and surpassing the state average for the first time. Just as importantly, graduation rates among students in poverty have increased from 61 to 70 percent as well as significant gains among every racial demographic: Native American up 19.6 percent; Pacific Islander up 17 percent; Black up 14.4 percent, Asian up 13.9 percent; Hispanic up 9.5 percent; and White up 8.2 percent. But we’re not there yet. The 50 percent community goal increase means Tacoma needs to reach an unprecedented 87 percent high school graduation rate and a 47 percent college and technical school completion rate by the Class of 2020. We know the climb ahead will only get steeper, the closer we get to our shared community goal. But together, Tacoma is striving for every child. WE WILL Graduate Tacoma! Tacoma’s graduating Class of 2015 celebrates in front of the iconic City Waterway and Cable-stayed Bridges and the Tacoma Dome — proudly flying the Graduate Tacoma! flag above the city skyline. Eric Wilson is president & CEO of Graduate Tacoma! in Tacoma, Wash. Graduate Tacoma! is the communitywide movement to help every child achieve success from cradle to college to career. Graduate! Tacoma is a Sustaining member of the StriveTogether Cradle to Career Network and is anchored by the Foundation for Tacoma Students.